I came to live in Bulgaria in 2011. Here I met many kind-hearted Bulgarians, especially among old people. Probably my different, Asian faces, kindled their curiosity from the very beginning, so they would start a conversation with me about something or another, and sometimes even “introducing” themselves by giving me a small gift. Since childhood, I grew up with my mother and father, but as they have a great number of siblings, my elder brother and I seldom had the opportunity of spending time with our grandparents. And when such an opportunity came, it was only for the Chinese new year festivities, when we paid visits to our four old people. And although we loved them from our hearts, we never experienced that heartfelt and abiding connection of love between grandparents and grandchildren. In my childhood, Mom often punished us physically, and in such moments I was longing to have a grandpa or a grandma beside me: they would be my defenders and would intercede with Mom for me—I had seen such a thing in the neighbours’ yard! This is the reason why I cherish a special warm feeling for old people and have always loved to talk with them about simple daily matters, or listen to their memories and stories. Of course, in the beginning, when I had just arrived in Bulgaria, I had no way to communicate with old people because of the language barrier. The first old woman whom I met was naturally my husband’s grandmother—Grandma Penka, a wonderfully kind-hearted 80-year-old village woman. She lived alone in her old house, which was quite near the house of my parents-in-law—some 20 metres!—so it was really easy to take care of her. Grandma liked to live by herself, not only because her old home was full of her entire life’s memories, but also for its small and bonny yard. Under luxuriantly verdant vines, whose branches were gracing the yard, she had planted every description of motley flowers—so typical of every home’s yard in Bulgarian villages: even on a stride of land would Bulgarians grow a bunch of flowers. Not accidentally Bulgaria is known in China as “the backyard of God’s house.” Apart from flowers, portions of the yard were taken by a vegetable-garden and an old greenhouse, around 10 square metres. In it they grew tomatoes and cucumbers. Outside there were other posts with ripe tomatoes and Bulgarian peppers, too. When I met Grandma first, she immediately went to the garden and picked several small cucumbers and tomatoes for me to taste. The cucumbers had a crunchy, delicious appearance, and the tomatoes were so big that I could hold one only with both my hands. When I first met Grandma Penka, I knew not a word in Bulgarian and I could not communicate with her, so my husband had to translate for me. Through translation, but also from the wonderful smile on Grandma’s face, I could feel her goodness and her love of me. After a couple of months my husband went to work in China, while I remained in this little village with the baby in my womb. Every day after breakfast I went to Grandma’s, took out my already prepared notebook and began to talk with her in a strange, awkward Bulgarian—simply to communicate with her. And the old woman answered with a downpour of words, which I could not grasp, but nonetheless filled me with joy and warmth. I came to Bulgaria in the height of summer. Before I noticed, here came autumn! Having grown up in the Chinese South, I discovered the beauty of Northern autumn for the first time, with its brightly coloured leaves falling to the ground. In Grandma’s yard there is a huge nut-tree, which—in Grandma’s words—was planted in the year of her birth, 1930. In summer, we relished the cool of its enormous shadow; to me, this tree revealed the truthfulness of the ancient Chinese wisdom: “Progenies enjoy the cool shadow of the tree, planted by their ancestors.” When the walnuts ripened, Grandma would take me many a time, limping with her cane, to that tree; she would rummage the fallen leaves under the tree and we would collect the fallen walnuts. After we filled a small bucket with them, she would let me pour them into a wooden crate, explaining we need to allow them to dry, so as to store them in a chest. 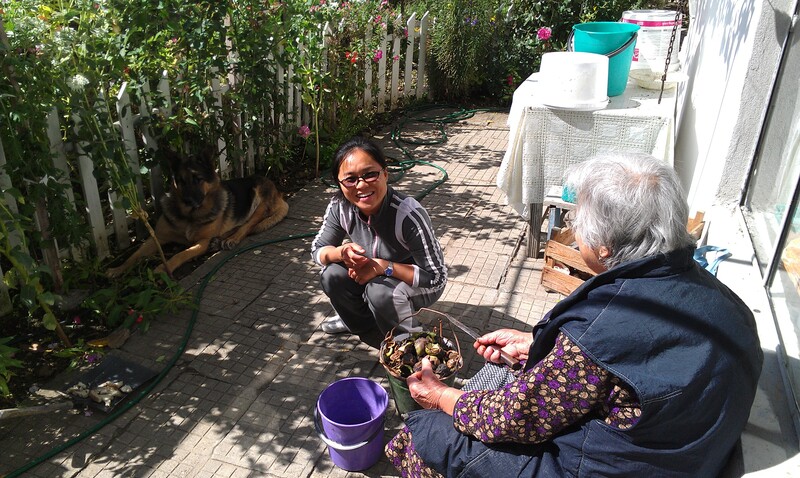 To me, these moments of collecting walnuts were precious—and Grandma was rejoicing in true gladness, watching me pick them with greedy diligence. Sometimes she would sit on the stump outside the yard, in front of the door, and would peel walnuts with her shrivelled old hands, and then gave them to me with the warmth that Grandmas cherish for their own granddaughters. At the same time she would let the old dog, a German shepherd, play around and amuse me. In Grandma’s low kitchen there was a cupboard, where one could invariably find small treats—waffles, chocolates, corn-sticks (which she used to call “cocoons”), stickletti etc. Every time I visited her place she made me go to the cupboard and take something, even later, after I gave birth to my first child. This is how my day passed: first I took breakfast, then nursed the baby, then I took advantage of the first rays of the early morning and took the baby for a stroll on his pram; afterwards I always went to Grandma for a chat. She was always capable of amusing the little boy—from a matchbox and a few matches she made for him a house, or a train and he was happily laughing. The days I spent together with Grandma filled my life with wondrous warmth and happiness. They were especially important for me, because allowed me to “take my share” of the feelings between a grandmother and a granddaughter, of which I was deprived in my childhood. 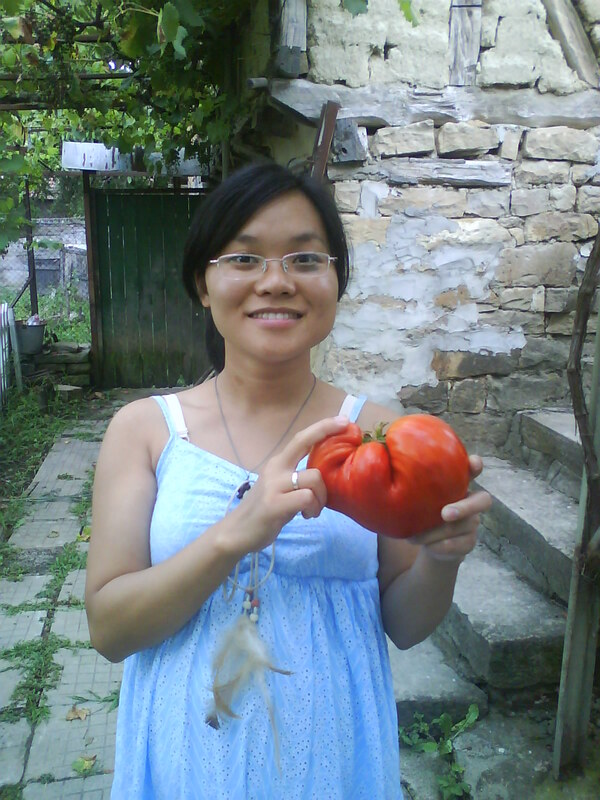 On the other hand, from her I learned a lot of useful experience—how to make seedlings, how to look after the vegetables, which I remember perfectly well. Even now, when I am taking care of the yard we inherited from her, I follow her instructions. And the seeds grow excellent in this fertile black soil, inherited by Pei’s ancestors—a land that brings forth the tastiest vegetables and sweetest fruit for our family! After Grandma Penka left this world, for the first time in my life I felt the pang and sorrow of parting with a loved one. Moreover, for a long time I could not accept the truth that this parting had really happened. Every time I went to the old house and glanced at the flowers her hand had planted—every little flower, every blade of grass, everything in the yard whispered memories of her into my ears. Except Grandma Penka, I was lucky to have known another Bulgarian old woman—my husband’s maternal grandmother, Grandma Lènche. She also brought me a lot of grandmotherly love and warmth that I lacked in childhood. She would spend with us several months in a year, both in summer and winter. Compared with Grandma Penka, Grandma Lenche was a more jovial and cheerful old woman. She was a year older than Grandma Penka, but she used to joke with me in a far more “liberal” way, for instance, she would ask me to go and find her a Chinese grandpa, so they could live together. 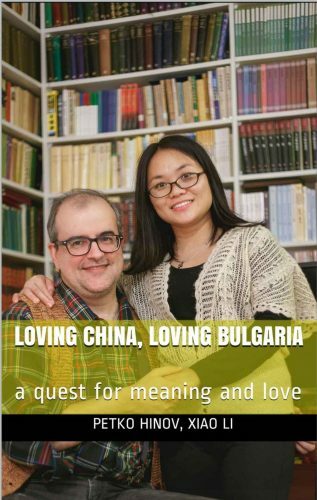 Precisely because of her bright character she infused in my life in Bulgaria then—while my husband was working in China—many bright moments which banished my feeling of loneliness, moments so merry at times that I would laugh at her jokes to tears. Her first visit to our village, after I had settled there, was in the wintry November of 2011, just a short while before I delivered my son. Mom was afraid I would feel bored during the day (while they were at work), so she arranged her mother to come from Plovdiv to keep me company. 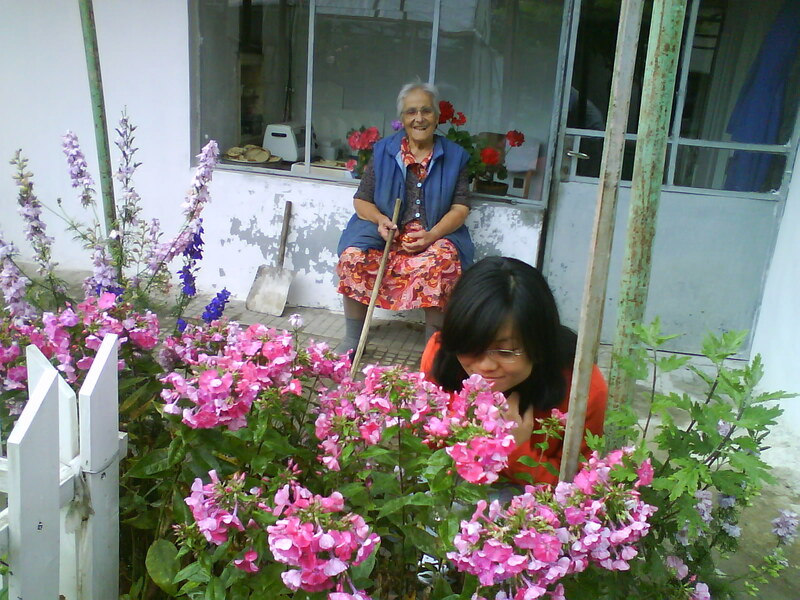 Grandma Lenche was enjoying good health at that time and could still walk without difficulty. Every day after breakfast she would go out with her walking-stick for a stroll with me; and she used to hold my arm. On the way, she would greet everyone who came in sight, she would wave her hand and accost our fellow-villagers for a chat. Sometimes we would find walnuts at the road’s side and then she would fill up with them both large pockets of her sleeveless jacket; and after they bulged conspicuously, she would touch them and laugh. When the first deep snow fell, I would only keep the warm room or amuse my Babyboy by the blazing fireside. 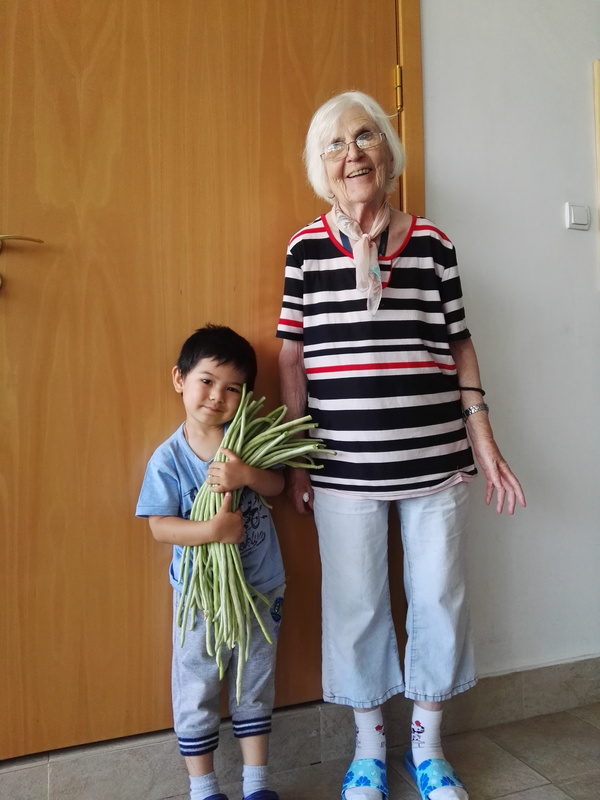 In summer, Grandma Lenche would come to our village, since her apartment in Plovdiv became intolerably hot. And as we were all one family, she would stay with Mom two or three months. 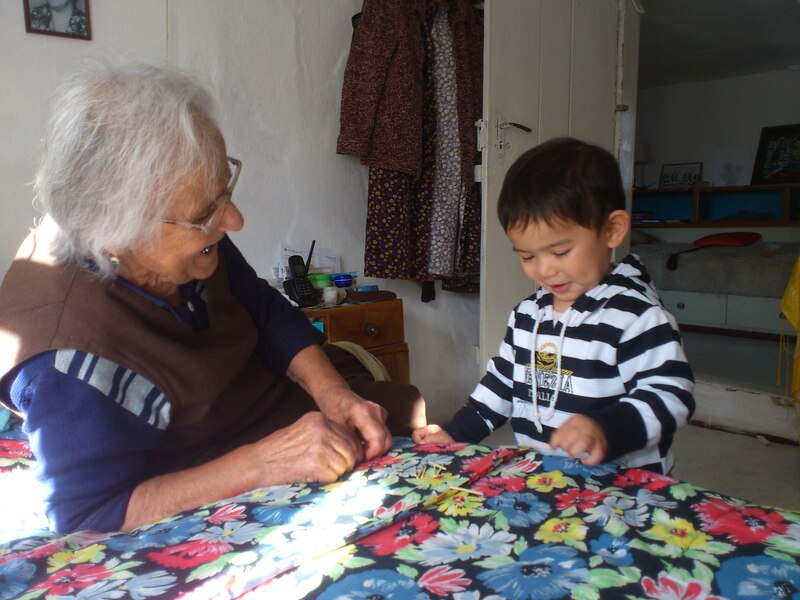 Grandma Lenche was a city lady and now she could enjoy our simple village life with great delight—we would stay under the cool shadow of the tufty old nut-tree, we would have ice-cream together, watch the children play tag or have fun with water. And when we were preparing jars with preserved food for the winter, she would eagerly take part. The time I spent with Grandma Lenche was not very long—several months in a summer or a winter—but during those four-five years, when this time approached, we were all awaiting her with eager hearts. Alas, she left us forever in the summer of 2017. All of us, including my parents-in-law, were at my parents’ house in Chongyi, China. That is why we could not see her for the last time. My sorrow for her will stay forever in my heart. In the several years I spent in Bogatovo, there hardly remained a road or a path in the village which I did not come to know during my daily strolls. I came to know many faces, too, and though it is difficult for me to remember their names, I can easily point the house where they live. That I also owe to my son, for the walks I took him out for during those years. These daily strolls became a sort of custom for me—my little boy also became accustomed to this simple, but not boring perambulation. He loved pulling one of his little cars or trucks on a string, holding my hand with his free hand. And thus he would start every day of his. Sometimes he would stop at the wayside and would curiously glance at the grass, or a flower, or a tiny bug. This is how he began to know the surrounding world and the first words of his mother tongue, the Chinese language. Every day, at the end of our short travel, we would pass by a big and round, convex roadside mirror. By its side there was a house with a little door, and there lived Grandma Donka. Ever since I had come to the village of Bogatovo, once she noticed me passing by her door, while walking with my Bulgarian Mom; Grandma Donka immediately sank back into her yard and after another moment she came out with a cluster of grapes which she handed me, uttering benedictions for the health of my unborn babe. She did this with extraordinary cordiality and warmth. Later in the autumn, they were preparing the liutenitsa puree, so traditional of all of Bulgaria. It so happened that I passed by her door. 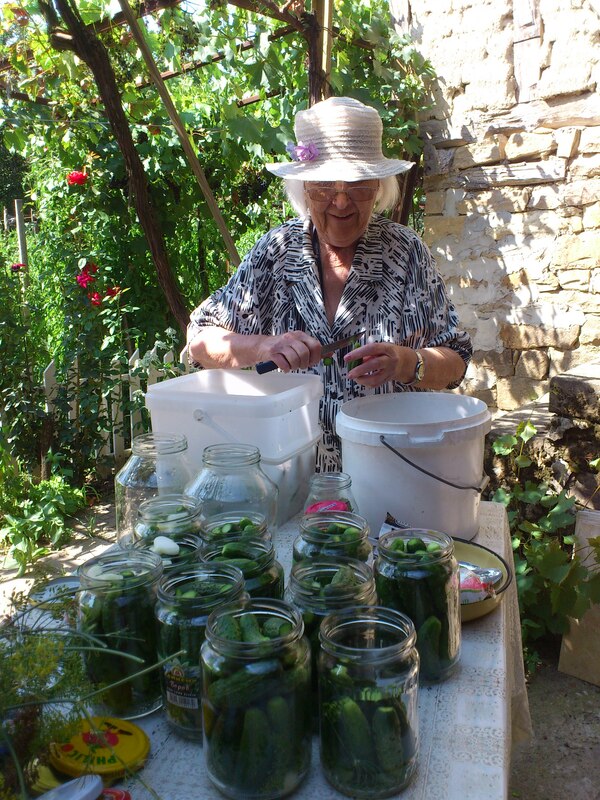 This time she went in and reappeared with two jars in her hands—one with liutenitsa and one with honey, both home-made. Then she blessed me again and wished lots of health to me and my unborn. I did not have the chance for a closer communication with this Grandma Donka, we would now and then meet on the street and talk, when I was passing by her house. But her warmth and kindness always touched me deeply. Last year I happened to walk past her door as usual and was quite surprised by the weedy grasses which had grown around her threshold. Only after I approached the door I noticed the obituary. This old woman had passed away recently. During our walks we passed by another old house, near the village square. There lived another family of old people, a grandpa and a grandma. Once the grandpa accosted us very cordially. He told us his name, Grandpa Lazar. He mentioned he was a good friend of my husband’s Grandpa Petko. He wouldn’t let a chance slip without praising Grandpa Petko for his kindness—how obliging, warm-hearted he’d been, how he’d helped many people in the village. Years ago, Grandpa Lazar would often visit him and drink together rakiya (the Bulgarian baijiu, fruit brandy, usually made of plums or grapes). He would even visit his house in the town of Sevlievo, where we now live. Every time we met him during our walks, he would always start a warm conversation about what-not. In winter, we seldom came out. One day, I remember, while passing by his door, Grandpa Lazar came out and eagerly talked to us. Although our encounters with Grandpa Lazar were short-lasted—we’d stop at the roadside, exchange a few warm remarks about ordinary, household matters—by and by I got used to pass invariably by his house and stop for a small talk. Two weeks ago, however, while having a walk with my children round the village, I was passing as usual by Grandpa Lazar’s yard. Unexpectedly, I noticed a new obituary on the door. I took a cautious glance at the photo and found out with surprise, that last month this old man had, too, passed away. Why, it was quite recently that we stopped there with the children and had a conversation with him! This instant I called my husband on the phone and when I told him this, he was also taken by such a surprise that he asked me several times had I seen correctly, had I not been wrong? This new parting threw me into a genuine grief, but my greater grief was that a whole generation of Bulgarian was passing away and was leaving behind old, empty houses with abandoned yards overgrown with weed. Had their progenies settled there and were taking care of their lovely land, then well! 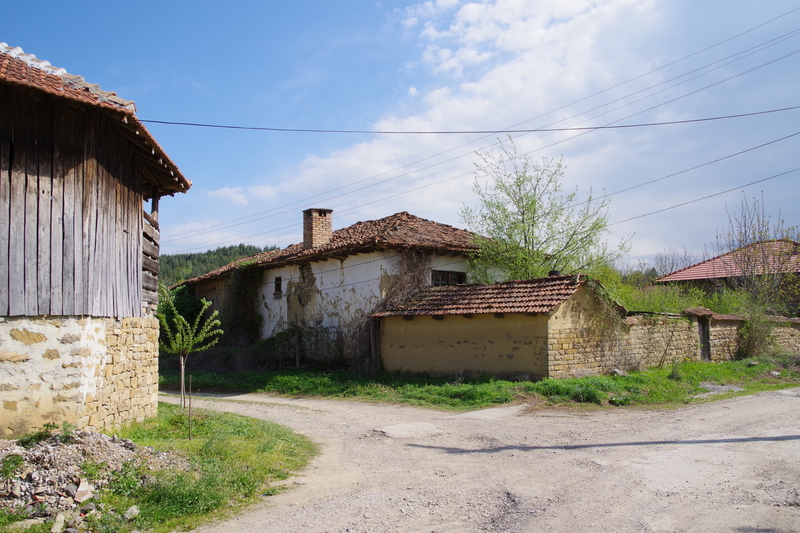 Otherwise, the wind and rains of time will gnaw and corrode, and little by little will ruin these old Bulgarian houses, full of so many memories.